The co-founders of Crowd Surf, a marketing, publicity & artist management company, based out of LA, Nashville & NYC, have teamed up to answer the question: “How do I get a job in the music industry?” Packed with over a decade of on the job stories, comedic anecdotes, valuable information and a ton of inspiration, Jade Driver and Cassie Petrey aim to guide listeners on creating their dream jobs in the music industry. Each week the podcast will host guests from all facets of the industry ranging from publicists, producers, photographers and even music artists to tell their own stories. COLLEGE! The best time of your life...but don't party too hard because taking advantage of all of those extra curricular clubs, volunteer activities and internships could just jump start your career! MTSU alums Jade and Cassie and Belmont University alums Justin and Bobby talk about what's it's like to go to a music business school and how the hustle starts before you graduate. Wondering if a music business program is right for you? We tell you what to expect and how to get the best experience out of your time on campus. This week we welcome our favorite duo from across the pond, Max & Harvey! Not only do these two lads have the musical talent -- and those cute mugs -- but they've got the business sense to back it up. The guys have put in the hard work, sacrifice and dedication to sign to RMI / Hollywood Records, win a Radio Disney Music Award and have their own special on BBC at age 15. Find out how they got there by listening now! This week we have a powerhouse trio in the studio to talk mom life as a pop star parent! Keri Seavey, Kristin Stanford and Myta Herron (moms of pop group Why Don't We members Daniel Seavey, Jack Avery and Zach Herron) share with us the journey of their sons’ careers from their early years of busking in the street - before they were even old enough to drive - to moving to Los Angeles and playing Madison Square Garden. Hear their story in a way you've never heard it before! This week we welcome Adam Davis, Digital Producer for America's Got Talent! Adam grew up a kid in Kentucky inspired by his idol Garth Brooks. After performing as a child, Adam continued his career in front of an audience becoming a Nashville celebrity as "Intern Adam" at 107.5 The River. As social media and celebrity culture hit the internet in the early 2000s Davis shifted his career to the digital realm joining the team at The X Factor U.S. and has now been running the digital initiatives at AGT for over 6 years. Find out what Adam does on the daily and get some secret scoop on some Cassie and Jade's embarrassing moments straight from their friend of over a decade! This week we speak with Crowd Surf's Senior Branding Manager, Helen Showalter, who works with artists like Why Don't We, Backstreet Boys. Eben and Kim Petras. She talks about how her time spent working on artist street teams helped her hone her craft, mainly by stalking down Jade and Cassie and talking her way into a job at age 19. Oh, and she loves Harry Styles. This week we welcome Director of Publicity at Crowd Surf, Nina Kolb! Nina shares with listeners how she started hustlin' at an early age to get her first internship in radio, moved to Los Angles to pursue bigger opportunities and started a career in music publicity. Nina now works with artists like Why Don't We, Andy Grammer and the Backstreet Boys to name a few! 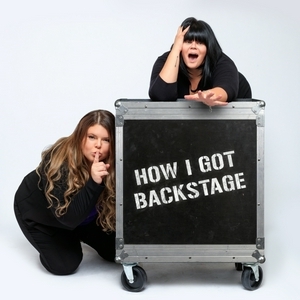 Welcome to "How I Got Backstage," a podcast about how two girls from small towns, with no entertainment connections, grew up to create their dream jobs in the music industry. Each week Jade Driver and Cassie Petrey will share stories from their careers and give advice and real steps you can take to create your dream career too! This week they introduce themselves, their passion for music, life as a fan girl and dig into the early years and the start of their marketing, publicity and artist management company, Crowd Surf.